In my first (technically second, I suppose) post from my weekend at the NCAA Tournament, I had to at least give a nod to #bracketbands. While my fanhood and my hobby are closely linked, there come times where content has to take a back seat to being in the moment, and with my team playing, this was one of those times. I do have a few observations from the games I caught though. Friday night's first game pitted Creighton against Kansas State. K-State was perhaps the team in my session I was most excited about seeing, as their marching contingent totes a Sudler Trophy. They're also the band besides my own that I got to see twice. They did not disappoint. My seat for Friday night put me kind of above Creighton's band (UMBC's too, in the second game) so they were playing with their back to me. My biggest gripe with them was that it felt as though they rushed everything they played. I had seen UVA just a couple of weeks prior in Greensboro for the Women's ACC Tournament. They're good at what they do, though they're a bit buttoned up. They play Party Like a Rock Star that has some choreo where the members literally look like they're just going through the motions. Still their sound is great, and they may have brought all brass with them to Charlotte. And then, there was UMBC. I'll first acknowledge that I am thoroughly, completely, and unabashedly biased, having spent four years in the band and knowing them in and out, even when I don't know the individuals. My alumni giving tends to go straight to them, I know all of the traditions, and began what has since flourished into an excellent drumline at a school with no marching band. So with all caveats on the table, we (yes, WE) killed it. I got to see The Down and Dirty Dawg Band coming and going - from the pregame social through the postgame victory lap on Friday, and again on Sunday. DDDB plays point guard for Retriever Nation's spirit. Faces are painted, bandanas are donned, and hell is raised every time they step into the arena. The book is deep, and still contains some pieces from when I was in the band, though they've evolved quite a bit. The drumline is a welcome addition, and does its own features that give the band an element that's less common in a pep band setting. And like our basketball team, they held their own. 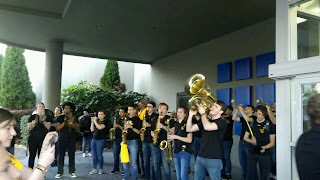 Sunday's game had me in the upper level, right around midcourt, giving me a pretty even perspective of UMBC and K-State's bands, and the Dawgs matched up favorably. With the unexpected extended stay, they even got to participate in Charlotte's St. Patrick's Day Parade. On Sunday, unfortunately traffic to Charlotte meant I missed the first game of the session - UNC vs. Texas A&M - entirely. I saw a pep-band-plus-sized contingent of the Fightin' Texas Aggie Band in Charlotte less than three months ago at the Fan Fest before the Belk Bowl, and Carolina's practically kin round here. Still, while I caught some bracket bands action, this was one of the times it took a back seat.